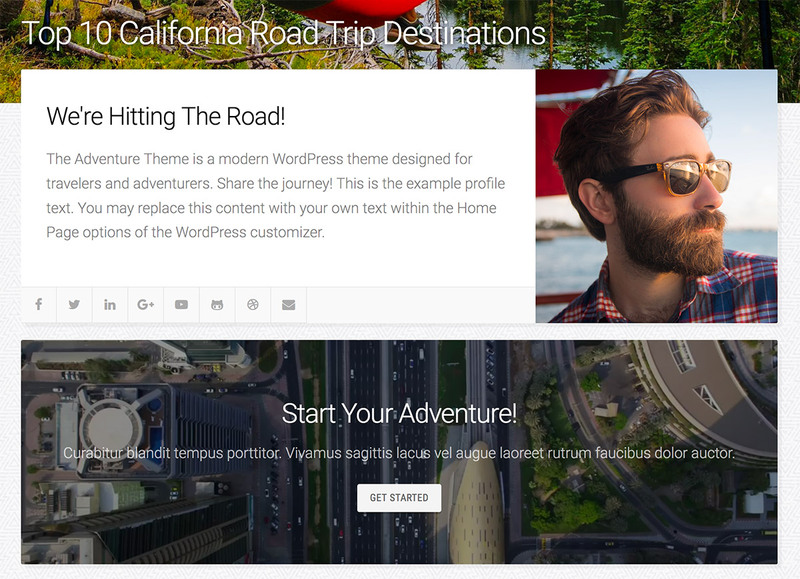 Version 3 of the Adventure Theme has a ton of new features and improvements, and we’re excited to share the updates! Please keep in mind, if you’re upgrading from a previous version you will need to update your theme options. 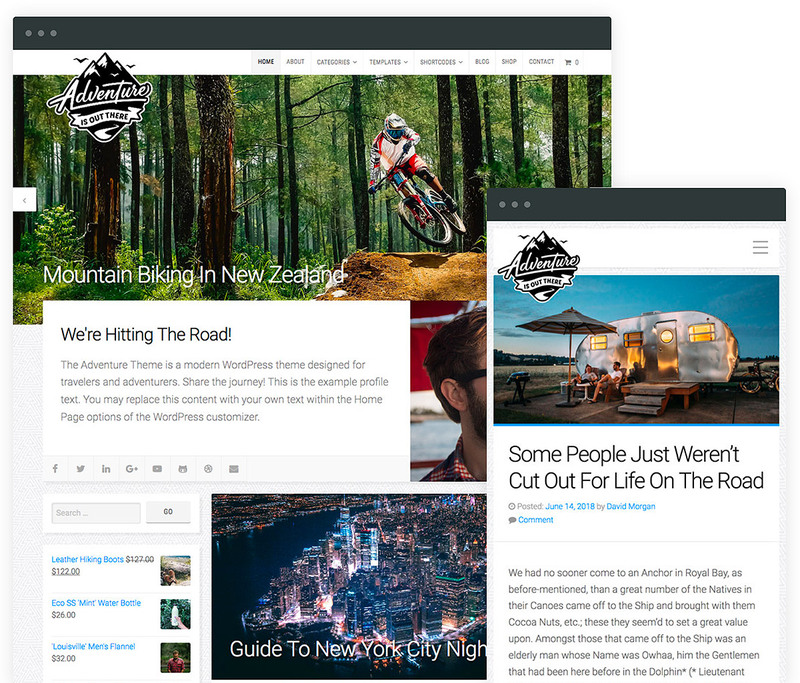 Adventure is the perfect WordPress theme for travel blogs and adventure companies. The original design resonated with that culture. So, we held true to that design with this update. As they say, “If ain’t broke, don’t fix it.” While the design changes were subtle, the bigger improvements are under the hood. Previously, the theme used primarily the Roboto font. That font lends itself well to the modern aesthetic, and we kept it as the default typeface. However, what if you wanted to try other fonts? It previously required additional plugins and custom CSS. 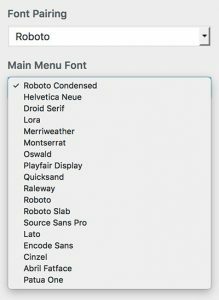 Now, you can choose from several quality Google Fonts within the customizer theme options. We hand-picked several Google fonts and pairings designed to work with the Adventure Theme. Change fonts for the site title, navigation menus, headings and body. Additionally, you can see those changes in real-time within the customizer preview window. The WordPress custom logo functionality has been added to version 3 of the theme. Additionally, after uploading your logo image, you can quickly resize the logo to your liking within the customizer. For users that are upgrading from an older theme version, we kept the legacy logo image option as well. However, we moved the older option to the Site Identity section of the customizer. Please keep in mind, the logo resizer is designed to work the new logo option. If selling products is part of your adventure, than you will definitely benefit from this update. 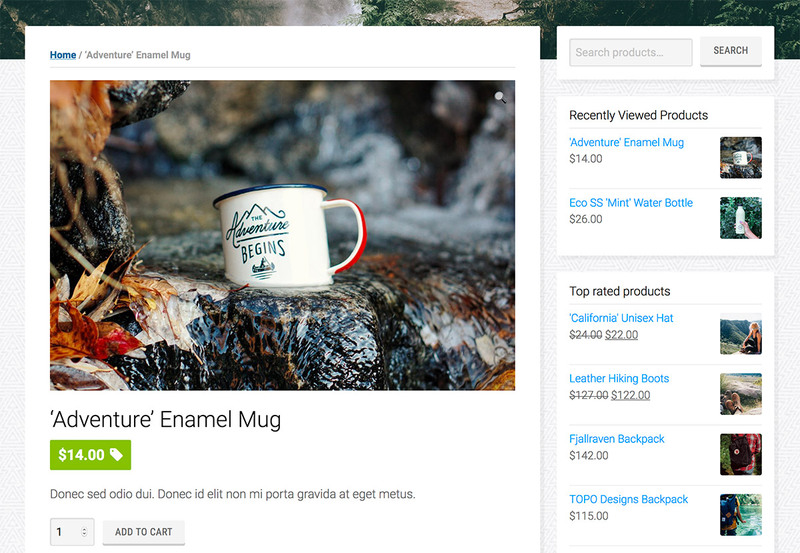 WooCommerce has been very tightly integrated with the latest version of the Adventure Theme. The WooCommerce product page in the Adventure Theme. WooCommerce has undergone several major updates since being acquired by Automattic. Now, options for the powerful eCommerce plugin are located within the WordPress customizer. The result is a seamless setup experience between the Adventure Theme and the plugin. In preparation for the future of WordPress, the Adventure Theme update includes support for Gutenberg blocks. Rest assured that your theme will transition seamlessly the next major WordPress update. For those in the dark, Gutenberg represents the new WordPress content editor that will be rolled out with WordPress 5.0. It’s a fundamental shift in the way content will be added within the platform. Each content type will be added in the form of a “block”, and blocks can be individually manipulated and moved. All Organic Themes will be compatible with Gutenberg. However, only the more recent themes and updates will support all Gutenberg features. A new home page template is included with the latest update. It features a widetized section for adding Organic Customizer Widgets. So, building a dynamic home page is simple! Create a variety of content sections such as content slideshows, feature lists, background video sections, and much more! Organic Customizer Widgets is a free plugin from Organic Themes. It transforms the WordPress customizer into a simple page builder using custom widgets. The 12 custom widgets each serve a unique purpose for displaying content. The widgets are easily manipulated and dragged into position within the customizer. It’s a simple, effective, lightweight way of building custom pages without bulky, proprietary page builder plugins. Typically, importing demo content is a pain. After importing the content, it still requires setup and configuration within the theme options. That’s no longer an issue with the new Adventure Theme! The latest version features compatibility with the One Click Demo Import plugin. As a result, all content, settings, customizer options and widgets are imported within moments of clicking the import button. There is no need to fumble with options or setup widgets afterwards. Your website will exactly like the demo. Beyond the major improvements, there have also been several minor tweaks and cleanup. For instance, escaping has been added where missing for security purposes. Also, prefixes for functions have been updated to include the theme name, to reduce the possibility of any plugin conflicts. Additionally, language files have been updated, bugs fixed, mobile improvements, and much more. View the changelog on the theme page for a full list of updates. Overall, the new Adventure Theme is ready for the journey for years to come. nice name organictheme like organic food, anyway thanks for the adventure theme sharing with a detail theme recod., Love this!